The Hudson Valley Renegades' Concession Stands have something for everybody. Whether you're looking for a traditional ballpark hotdog, a healthy salad or a savory, one-of-a-kind Southern Hudson Comfort Sandwich, we've got what it takes to satisfy everyone's taste buds. The place to be to enjoy your ballpark favorites. Featuring Sabrett Hot Dogs, Chicken Tenders, Hamburgers & Cheeseburgers, Fried Chicken Filet Sandwich, Nachos, Soft Pretzels, French Fries and much more! The place to be to enjoy your ballpark favorites. Featuring Sabrett Hot Dogs, Chicken Tenders, Nachos, Soft Pretzels, French Fries, Popcorn, Chips, Candy, Ice Cream Novelties and much more! This location hosts Family Style meals with different Entrées & Sides to choose from every game. Here for the game on Thursday, try some Fish & Chips, but we're going Southern on Friday with Southern Fried Chicken, creamy Mac & Cheese and Cornbread. Eben's Eatery also hosts some of our great Theme Meal Dinners like Thanksgiving Dinner, American Road Trip and many more! Because there's more to a sweet tooth than ice cream, the Tree House is home to Rascal's Favorite SnoCones and Fresh Lemonade. You will also find cotton candy and novelty candies here. Home of the Cracker Jack Burger! Crowd Pleasers is as the name implies-this fresh-off-the-grill stand allows our fans to have their burger, hot dog or chicken grilled fresh and it doesn't end there. Our fans get to choose from a great selection of fresh Rockland Bakery rolls delivered fresh daily, and all of our great cheeses and toppings! Too tough to choose on you own? We also offer some fabulous specialty sandwiches at this station. Try favorites like our Portabello "Burger" or the Cracker Jack Burger. Enjoy your Landshark with a delicious taco or quesadilla. Made to order with great daily specials. Classic beef, chicken, veggie or cheese offered daily with featured specials like our delicious BBQ Brisket, Mac & Cheese, BBQ Honey Mustard Pulled Pork, and many, many more! We have an amazing selection of craft beers in one location at the park. Thirty-eight taps to choose your favorites from-Sam Adams Seasonal, Stella, Davidson Brothers, Mill House Kold One, Shock Top, Blue Moon, and more. We also feature the new FROZEN Straw-ber-ita & Lim-er-ita. Some old, some NEW for 2017. We still have your twister fries and nachos to "Top Off" with fun flavor sensations-Buffalo Bleu Chicken, Garlic Parmesan, or Bacon Chili Cheese, but NOW imagine some of those fantastic flavors to "Top Off" your Sabrett Hot Dog??? You OK? Sensation overload? Have your fires, nachos, or dogs plain or fully loaded. By-the-Slice or By-the Pie this is the stand to be if you are in the mood for PIZZA! We also have some delicious Italian comfort foods available here daily. Craving a Sausage & Peppers Hero? The warm weather favorite is available daily at this stand. Try our Chicken Parmesan, as a plate or a hero, Stuffed Shells, even Eggplant Lasagna, and the kids love our garlic & Parmesan bread sticks. We also feature some unique and refreshing Craft Beer selections here. Quick serve items for your convenience. Bottled water, soda and Gatorade, chips, and other packaged snacks are available here. Gluten Free Package Snacks include brownies, cookies and Rice Krispi treats. We also offer our daily Salad of the Day and Sandwich of the Day at this location. 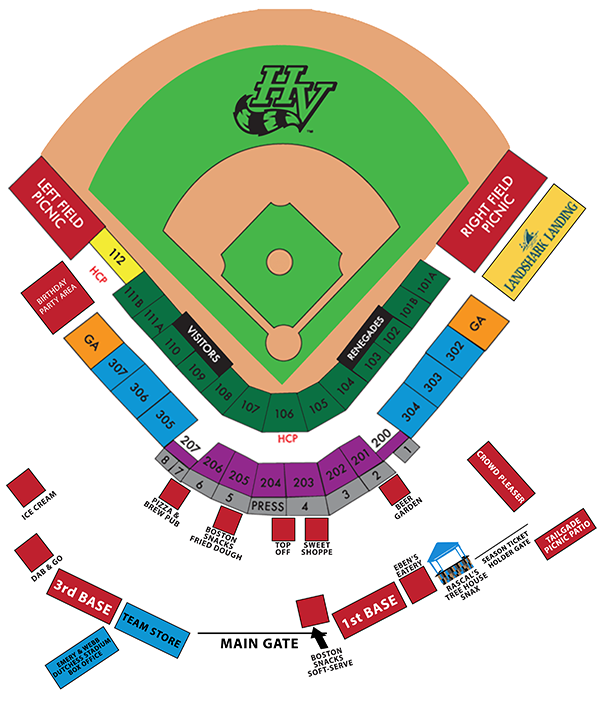 For more information on Concessions at the ballpark, contact the Front Office at 845-838-0094.